The Voigtlander 3.5/21 is a tiny, relatively affordable, manual focus lens for the Sony FE system. In this rolling revie I evaluate it’s performance. 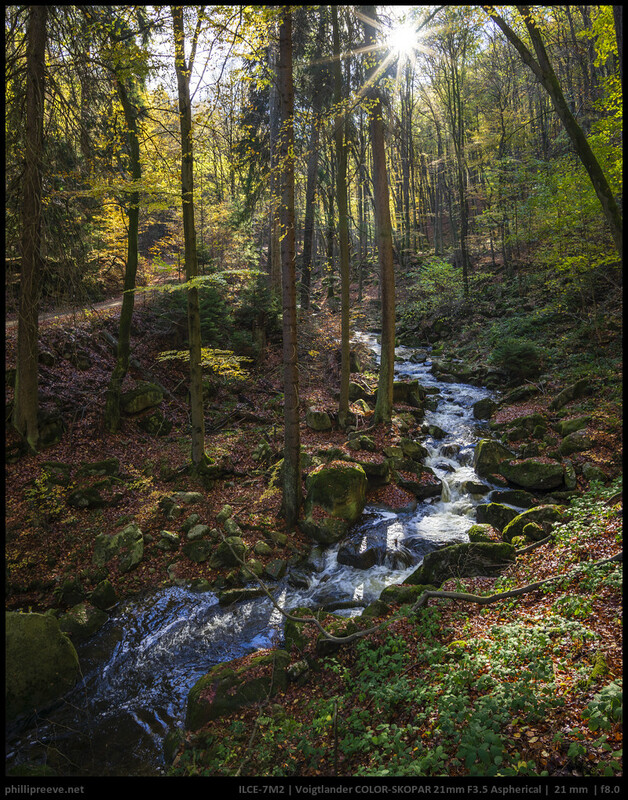 You can find most images shown in this image in full resolution in this album. The Voigtlander 3.5/21 sells for $699 at CameraQuest, B&H or amazon.com.749€ at ebay.de (affiliate links). I bought this lens at full retail price from my own money. 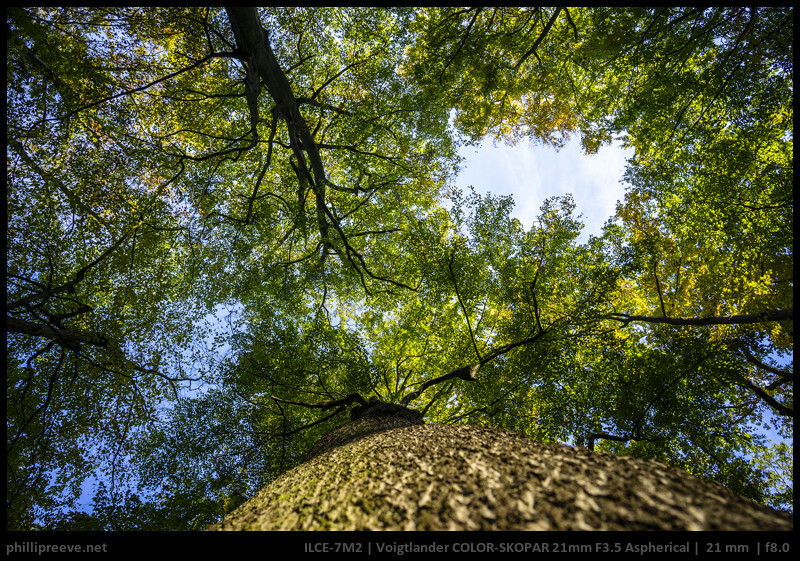 The Voigtlander Color-Skopar 21mm F3.5 is a fully manual lens so you have to change focus and aperture by yourself. The camera can’t change the aperture so S- and P-mode will not work as with native lenses. It has electronic contacts to communicate with the camera though. That provides correct exif-data, the OSS in all Sony cameras with IBIS will automatically know the correct focal length and the focus magnification can be automatically activated when the focus ring gets turned. 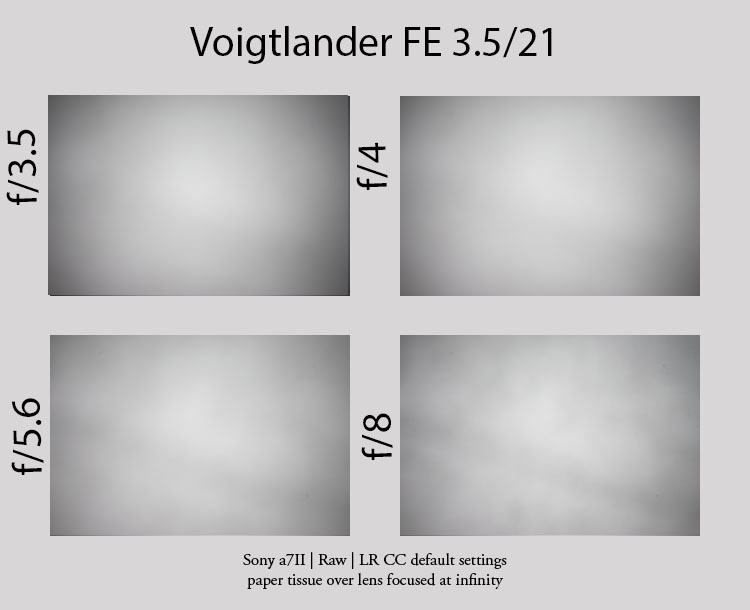 Unlike Loxia lenses the Voigtlander has a distance encoder so the camera will show a pretty much useless digital distance scale and stabilization might be a bit more effective. 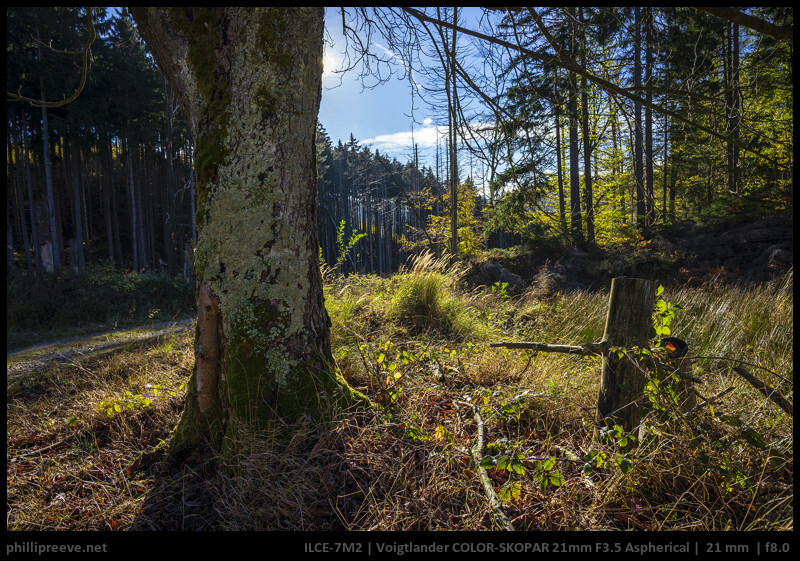 The Voigtlander 21mm F3.5 feels really solid. The lens hull is made from nothing but metal and tolerances are very low. Most but not all markings are engraved. There is no gasket around the mount and Voigtlander does not claim any weather resistance. Of course I can’t tell you how durable the lens will be in the long term. All I can do is give you my superficial impression which is very positive in this case. If you have used Zeiss Loxia lenses you will probably have been frustrated by the fact that there is no good place to grab them when you change lenses. This is not an issue with the Voigtlander since you can easily grab it by its base which is textured for better grip. The focus ring travels around 120 degrees from 20 cm to 1 m and a further 23 degrees to infinity. I think that is a very reasonable transmission for a macro but it is a bit slower to focus precisely at longer distances. The ring itself is well textured and the resistance is about perfect. The aperture ring situated at the front is a joy to use. It is made from metal with distinctive stops and a very pleasant resistance. I would have preferred 1/2 or even full stops but 1/3 stops work ok. The Voigtlander stops down to f/22. The Voigtlander 3.5/21 has a solid yet low profile hood which adds just 10 mm to the length so I always leave it on the camera for lens protection. The Voigtlander 3.5/21 is a very small lens, significantly smaller than it’s competitors and I think that is one of it’s most important qualities. 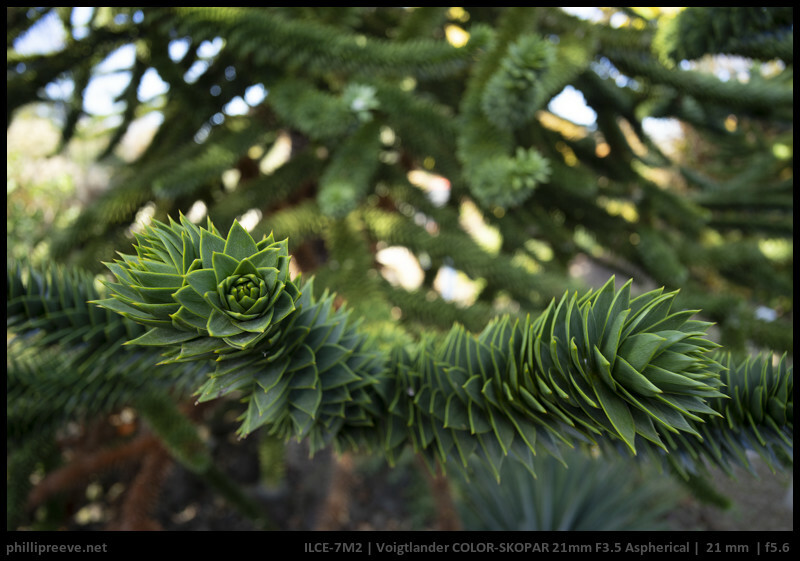 The Voigtlander focuses down to 20cm which can give an interesting perspective emphasizing a subject while including the background. As always evaluating flare is a complex matter since you can get any lens to look bad if you push it hard enough and a slight change of scenario will affect results a lot. I think the Voigtlander compares very well to other lenses, especially in regards to veiling flare. But not everything is perfect and I lost a few images in very demanding scenarios to ghosting. Sensor reflections can also be a serious issue and I am not talking about the very flare prone a7 but the a7II. I will post a few more scenarios in the next update. 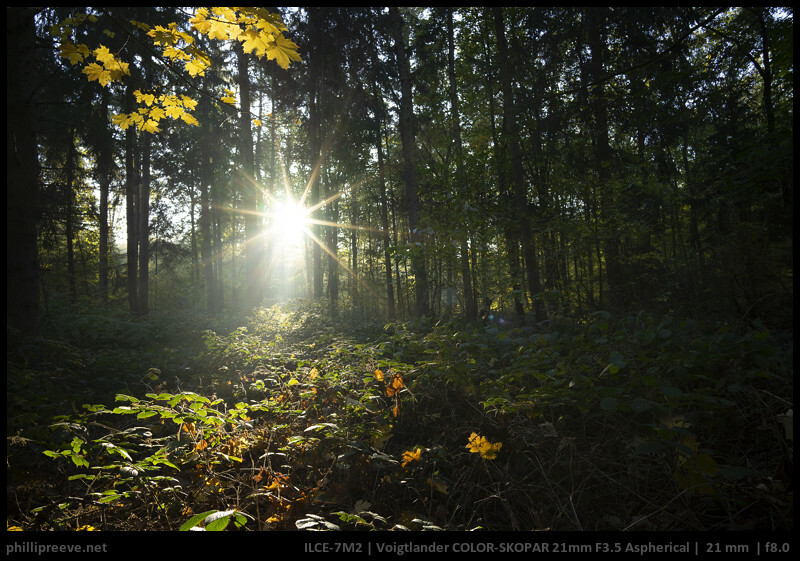 Voigtlander lenses are known for their very defined 10-pointed sunstars. Personally I like this effect a lot, other people don’t. You just need to stop down to f/4 until they are very well defined. Not a very important aspect with a super wide angle lens but bokeh is rather smooth. Unsurprisingly for a slow wide-angle axial CA is well controlled. 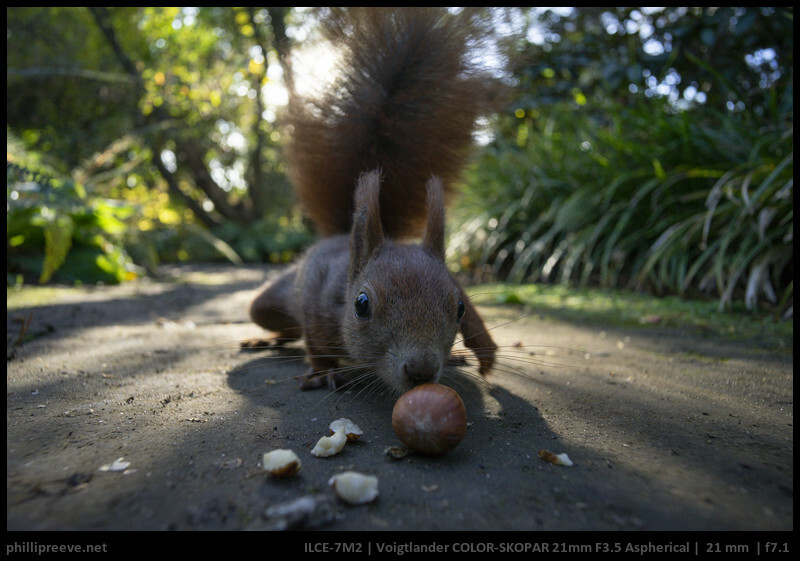 As I have come to expect with smaller Voigtlander lenses vignetting is very high at 2.6 stops wide open which is reduced to still high 1.9 stops from f/5.6. 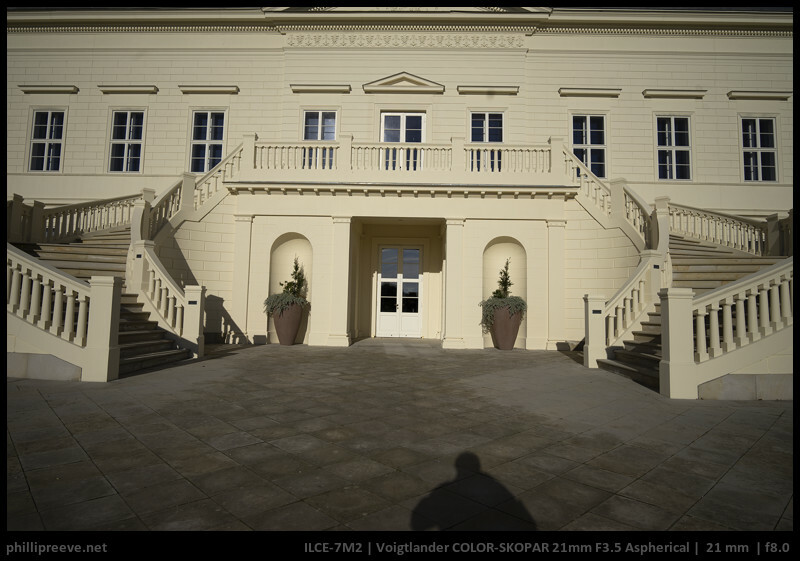 The Voigtlander 3.5/21 shows a small amount of barrel distortion. +4 in LR corrects it very well. f/3.5: Excellent in the center, good to very good in the midframe area and not that great in the extreme corners. f/5.6: midframe is very good now, corners are good. f/8: ever so slightly softer in the center, very good across the frame. All in all a very good performance. The Voigtlander is not the sharpest wideangle in the system but unless you compare it to other lenses directly you probably won’t notice that. 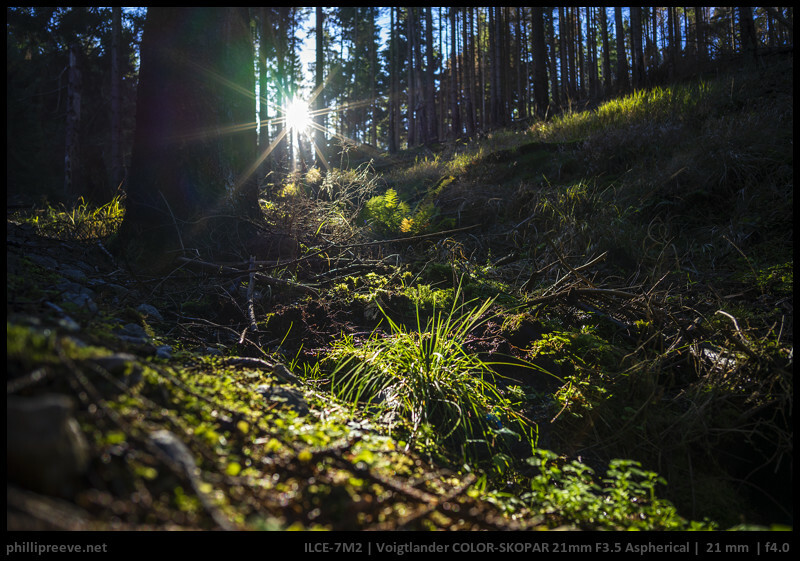 Zeiss Loxia 2.8/21: The Loxia is nearly twice the weight and price but it is a bit sharper especially in the midframe region where it also has slightly higher contrast. Check out Fred’s well done comparison which mirrors my experience. 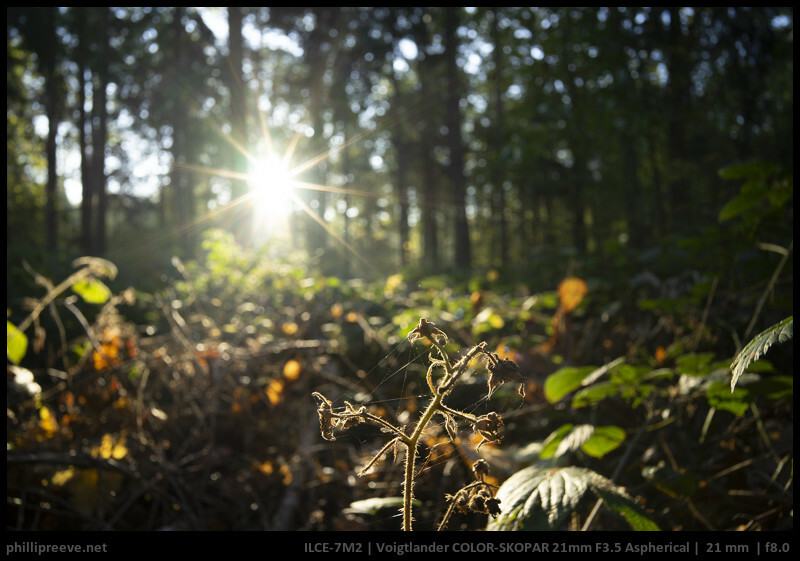 Flare resistance is different: In my comparisons the Voigtlander was better for one scenario while the Loxia was better in others. So if you are after the very best performance go for the Loxia. If very good is good enough for you and size and/or price are more important go for the Voigtlander. Tokina Firin 2/20: I haven’t compared them directly but I think that the slightly more expensive Firin is a little sharper and of course 1.5 stops faster which together with good coma-correction make it an obvious choice for astro. 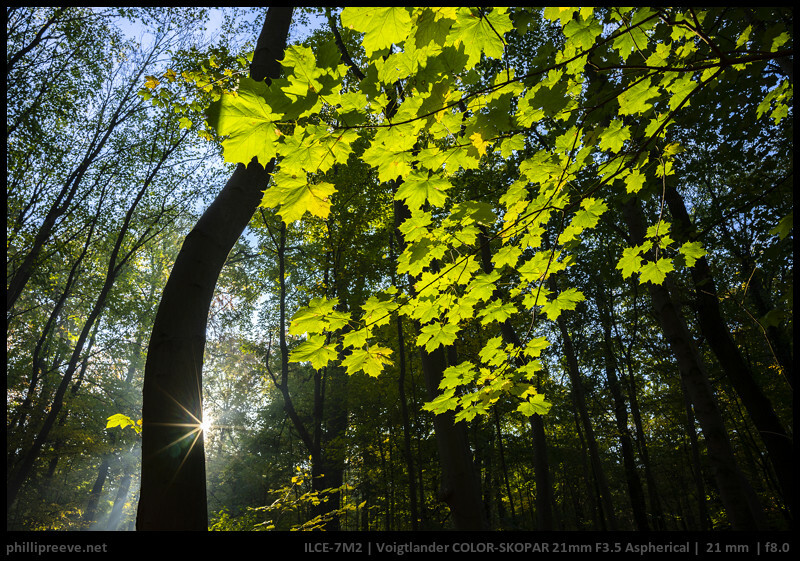 Because of better flare resistance, nice sunstars, better close-focus ability and smaller size I would prefer the Voigtlander as a landscape lens. 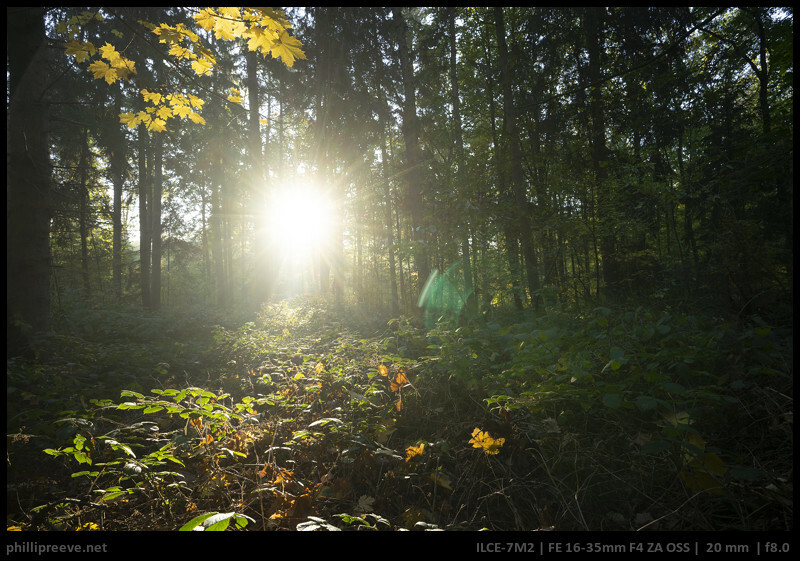 Sony FE 4/16-35 ZA: The only thing these two lenses share is the focal length. The Sony is much larger, heavier and more expensive but also more flexible with AF, optical stabilizer and a super handy zoom range. 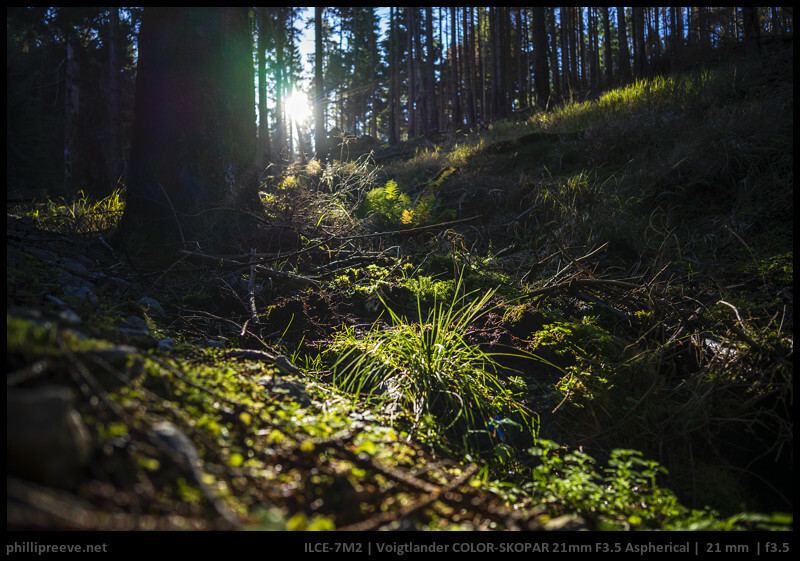 Performance wise the Voigtlander is a little sharper in the corners while the Zeiss beats it in the midframe region. 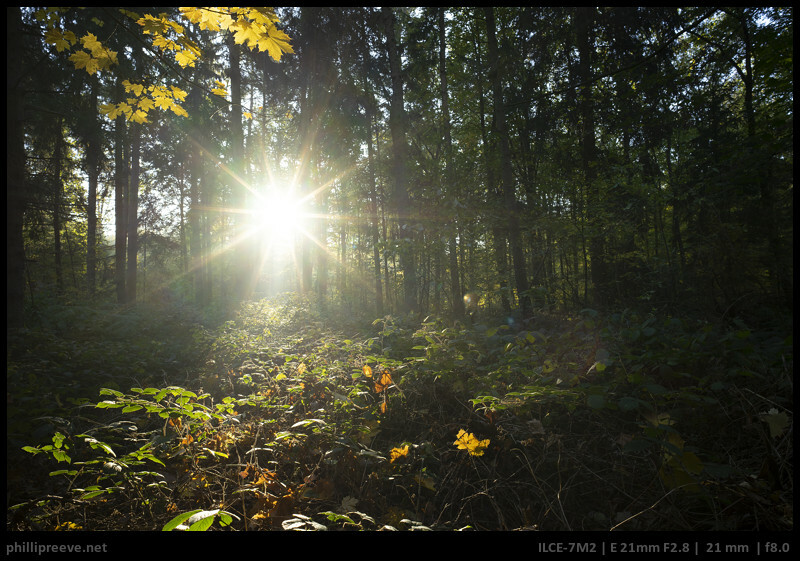 Flare resistance of the Voigtlander is significantly better but not perfect and sunstars are much more defined. Zeiss Batis 2.8/18: A little sharper, much higher volume, more expensive and I wouldn’t discount the difference in focal length, for a super wide angle 3 mm are very significant. Canon nFD 2.8/20: If you are on a tight budget the Canon is a decent wideangle solution. You need to stop it down to f/5.6 for good and to f/11 for very good across the frame sharpness and you have to consider the weak flare resistance but I was quite happy with the results in the end. 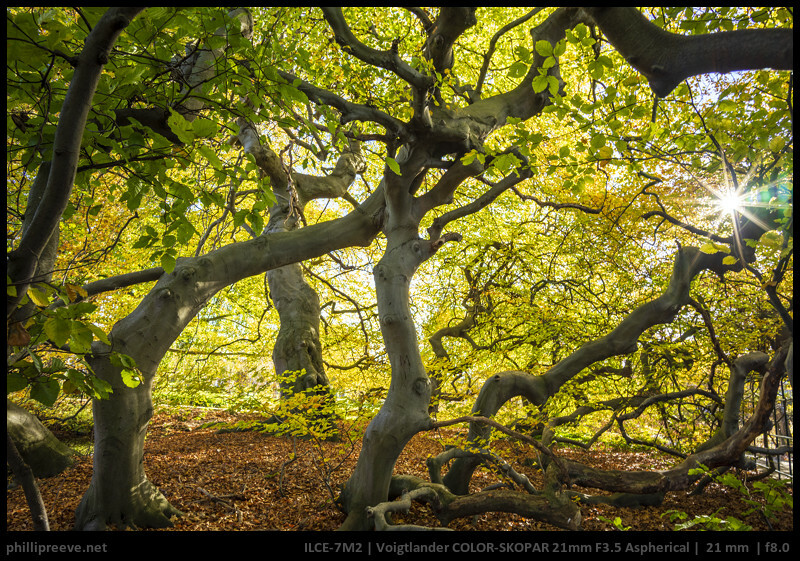 If you can afford it the Voigtlander is a more versatile and significantly smaller lens . Samyang 2.8/24: Again a rather different focal length. The even smaller Samyang is cheaper but it also performs worse in regards to sharpness and especially flare resistance. Handling is also less pleasant but it offers AF. 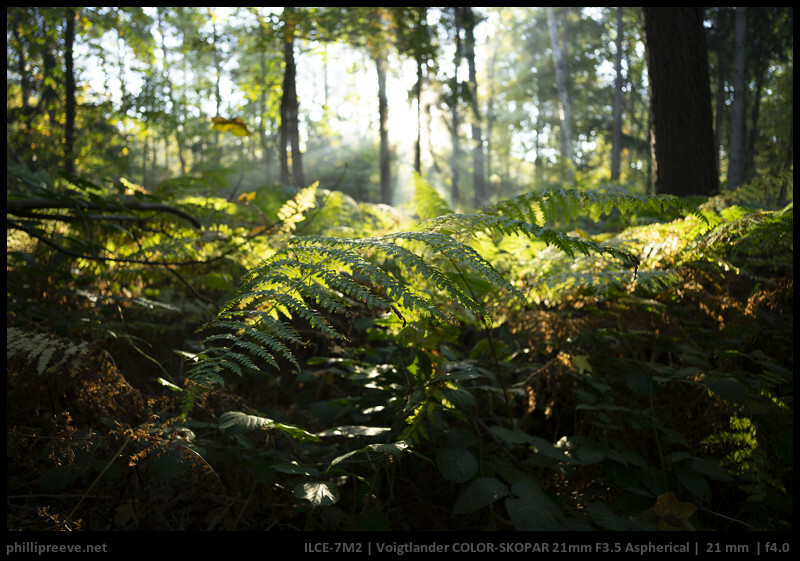 Cosina has answered our calls for smaller lenses and released the Voigtlander 3.5/21 at nearly half the size and weight of the competing Loxia 2.8/21. It a very well made small lens and one of the most pleasant to handle lenses in the system. Performance in general is on a high level with some minor tradeoffs you expect in such a small an (relatively) affordable lens. 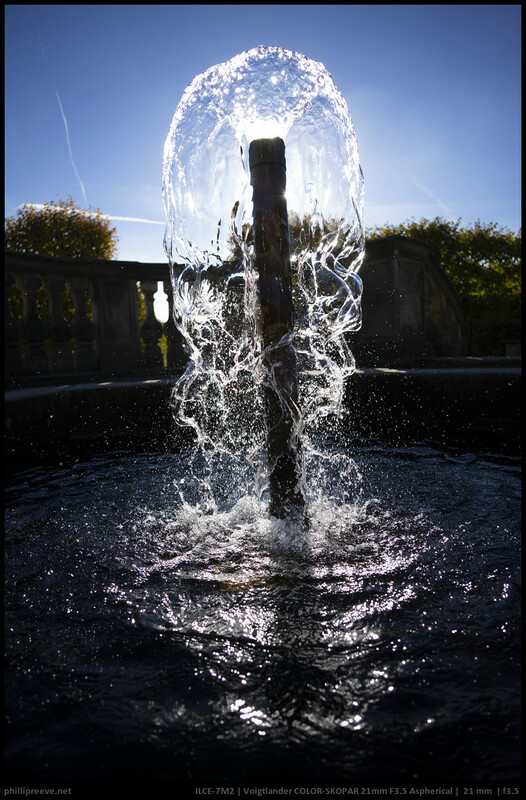 Sharpness is very good when the Voigtlander is stopped down a little but not quite as high as with the Loxia 2.8/21. Bbut at nearly half the weight and price it would be unrealistic to expect it to be on the same level. Vignetting is also pretty high and remains close to two stops stopped down. Apart from these minor deficits I find little to complain about. I think the Voigtlander 3.5/21 is a very attractive lens which finds a really good balance between a very small size, good performance and a competitive price. Therefore I have decided to keep my copy and not get a Loxia 2.8/21. I just discovered some of these Voigtlanders (the 65 is one, but it seems that all of the non wides do) report focusing distance to the body, whereas nine of the Loxias don’t. This is relevant because focus distance is required for 5 axis stabilization (without it, with just focal length, you get 3 axis). Could you test this and report it in your future reviews? It should be simple enough to test (even for lenses you don’t have in hand): just see if focus distance is/was reported in the EXIF data. Did you have a look at the exifs of the sample images provided? Didn’t think of that. Are they straight out of camera? Flickr must be removing the tag, because it’s absent. The tag is non-standard, so most tools drop it. All the photos I tried from your 65 review lack it, but the RAWs from the dpreview gallery (1) have it. Lenses without a distance encoder either report infinity at all times, or lack such info. But without straight out of camera images, it’s not easy information to come by (that’s why I was nudging you guys to include it in reviews, if it’s not too much of a bother). – the Voigtlander 65 does. – all their other FE-mount lenses do. The main advantage is 5-Axis stabilization on bodies that support it. Sony does not use standard Subject Distance tag for that. It has a proprietary tag for focus position. Exiftool recognizes it as either FocusPosition or FocusPosition2, and even presents derived (calculated) FocusDistance or FocusDistance2 tags. I don’t think FocusPositions survives the flickr or most Raw processors. Alternatively, if camera shows focus distance scale while using manual focus, you can assume lens communicates focus position to the camera. Thanks for the additional info. My reply must of got stuck because of links. It seems all FE Voigtlanders apart from the Wide Heliars support this, none of the Loxias do. Cosina literature states (2nd last line) that 5-axis stabilization is used (on bodies that offer it). 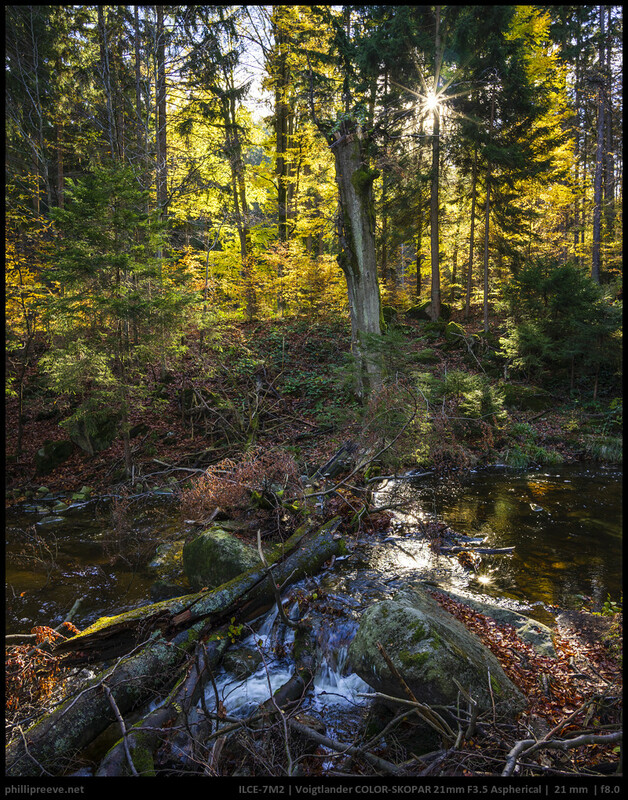 Do you know if the Loxia 21 mm supports 5-axis image stabilization? It does (unlike Voigtlanders) not transmit distance information to the camera. Voigtlander is coming with lots of interesting e-mount options recently… How would you rate the vignetting? Also did you have a chance to try the 50/1.2? Didn’t test vignetting. I expect at least the 2.5 stops the Loxia has. We had the 1.2/50 but I didn’t do much more than taking a few pictures of it. I am excited about this for the same reasons. I have the VM 21/4 and have found it pretty good considering, but some optimization, communication with the body, and slightly wider all for about an ounce of weight sounds like a great upgrade. I expected it to be heavier and more expensive. In that case the Lox 21 would have been an easy choice for me. Did Sony have their new GM 24 1.4 out on the floor? How do you feel about that one as a wide lens? Thanks for all these good news on interesting new products, which have been more or less systematically ignored by most reports focusing on the big brands. 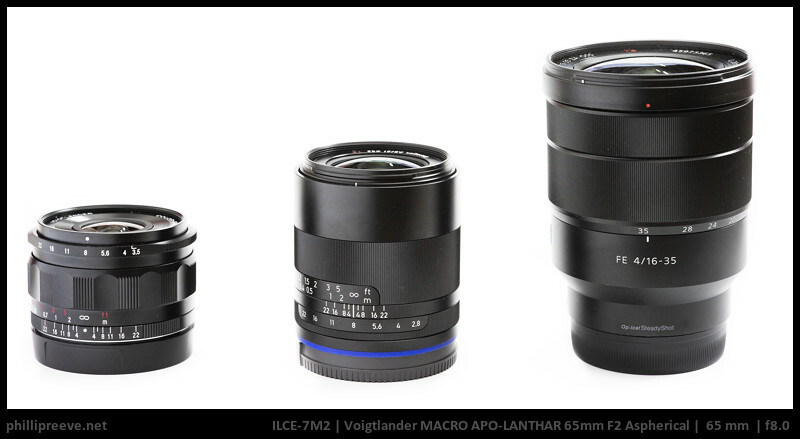 And speaking of missing accounts, what ever happened to Voigtländer’s f/2.5 110mm Apo Lanthar? I have seen some accounts of it being demoed in previous shows (https://m.youtube.com/watch?v=FQf-ty1s7Xs), but the absence of mention of it is a bit too loud and disconcerting by now. Especially for those of us who have already pre-ordered it. We decided to create a short article for each of the three new E-mount lenses (3.5/21, 2.5/100 and 1.2/50). We will review the 110 as soon as we get a copy. I used one at the times I got a 5D mkIII. Very good, light and simple. And at a very cheap price. 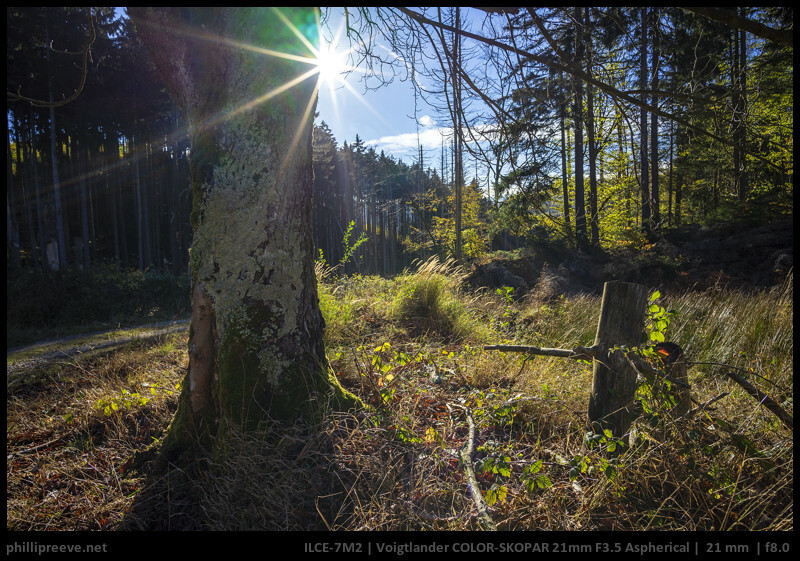 when the CV21/3,5 is similar to my Voigtländer Color Skopar 20mm f/3 ,5 SL II for Nikon you will have a nice good and small wide-angle lens. I use my lens on a A7r with no problems. Wonderful review. Thanks. It looks like for non-pixel peepers (me) the reporter mid-zone duo reported on Fred Miranda isn’t a huge deal. FM reported very competitive corner sharpness in the CV. Does your copy hit infinity focus at the hard stop? thanks… and sorry for the typos in my first (mobile-based) comment: I meant the “reported mid-zone dip” described by Fred Miranda. Well there is some midzone dip and the Loxia is technically the better lens. To me it comes down to portability and price vs some gain in IQ and speed. I am pretty sure that i will keep the CV and not the Loxia. I’m Diego from Italy and I could describe myself as an “advanced hobbyist”. I’m following your website since a long time especially because I have the same love for manual lenses (I started 30 years ago and I have sold all my AF lenses when A7 came in the market). Actually my preferred lenses were the CV10, the CV65 and LOX21. Recently robbers entered in my house and stole my lenses collection (I had several ZM) and my modern set. By miracle they left the CV65 but they took the Lox21 and CV10. To replace ZM35 and ZM50 I’m buying the CV40 but I am a little uncertain about the LOX21 (the lens you love “after” because I think UX is so so…) or the new CV21 (I think the 5 axis is a plus for travel photography). Which would be your advice? I have read in other forum that at infinity the mid-field is “so so”… but… one opinion more, when extremely qualified, is really accepted. Thank you very much in advance for your time and kind attention. Mid-field isn’t great but it isn’t bad either. I certainly notice a difference in a direct comparison but without I probably wouldn’t have noticed it. Unless you feel that you need the very best IQ or f/2.8 I would probably prefer the CV over the Lox. Thank you for your feedback. I think I’ll go with the CV21 and, at least at the moment, with some old C/Y (in particular the 2.8/28) because I have always appreciated their organic colors. How does the this lens compared to Tokina Firin 20 mm 2.0? Based on your review for both of these lenses? Tough to say without a direct comparison. I think the Firin will be a little sharper but I prefer the handling of the CV. Waiting for an update then. Thanks for all the hardwork and nice review! Cheers! Your site is an incredible resource — thanks. I use both the Sony a7ii and the a6500 and so prefer lenses that will work well on both. Do you have any thoughts on how well this lens will work with the a6500? I have yet to find a good lightweight wide angle for the a6500 and was hoping this Voigtlander may be the answer. Thanks. Since the midzone is already a little weaker on the a7II I would expect it to not be great on the a6500 in regard to sharpness. Thanks, Phillip. I bought the lens earlier this week and am enjoying it very much on both the a7ii and the a6500. It seems sharp enough for me on the a6500 and looks and works wonderfully on it. I have another question, though. Is there any way to use the Voigtlander without Sony’s focus magnification? The AF/MF switch on the cameras that works so well with automatic lenses doesn’t seem to work with the Voigtlander. Although I love focus magnification, I’d like to be able to switch back to no magnification at times. Thanks for the review, my only remaining issue is, could this be usefull for astro??? at f/3.5? You can certainly take astro pictures with it and quality might be ok but other lenses like the Firin are obviously better. with light pollution filter, iso6400 and higher, stacking 20-30 images could work even though it’s 3.5, right? See this article to see why stacking is lots of trouble and often does not work properly for lanscape astrophotography. Furthermore the “light pollution” filter will take some light away for every bandwith making you end up with an even slower lens. Stacking is pretty easy when using sequator, but the “halos” at borders are still an issue. So as I want a small portable sunstar producing uww lens I think the cv21 could really nicely fill this spot (instead of irix 15mm) and if it isn’t to great for astro the cv35 will have to fill that gap. Would be nice to get Tokina Firin included in the comparison. Particularly helpful since you have experience with both! Will add it later but I can’t do any direct comparisons. do you honestly consider the FD20mm an alternative? i have a lot of trouble with hotspots in the center of the image. Ruined plenty of good shots for me. I used it for quite some time and while I had one or two images with a hotspot it was not a common issue. It obviously comes with a number of compromises but on the other hand it is dirt cheap. Very interesting little lens with what appears to be very decent performance. Will definitely be checking back for updates. You mention some issues with sensor reflections, which is something I have encountered before in other reviews here, when using the a7 and a7II. Is there any information with regards to a7R cameras in this respect (specifically a7RIII)? 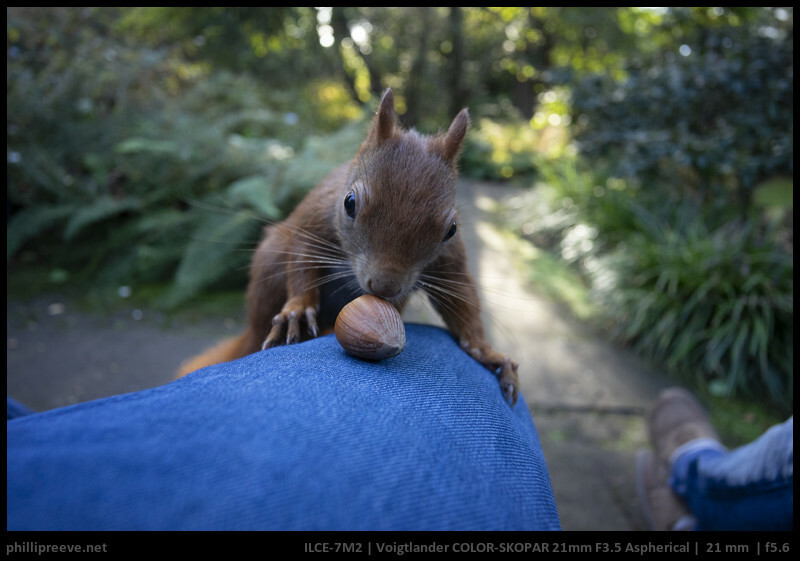 If you will be looking into comparison points with the Loxia 21mm, I am certainly interested in a distortion comparison, as the Heliars have proven themselves in this aspect. Also in contrast and microcontrast it would be interesting to see some comparisons, but I think the more demanding 42.2mpx sensor might be more revealing for this. Hello Phillip, Thanks a lot for this great review! I am looking for advice on this lens. I am thinking of buying a pre-owned Skopar 21mm/f4 M mount for my Sony A7 ii with an adapter with close focus function; in total it would cost me around 400 euros. This new Skopar for Sony is tempting too with increase sharpness around the edge compared to previous generations of Skopar. But is it worth paying 330 more euros (the 21/3.5 is sold 730 euros in France for the moment)? Do you think the increase in optical quality is worth the difference in price? Your help would be much appreciated! Thanks in advance. I wouldn‘t have to think about it for a second. Sharpness, vignetting, color-shoft and handling would making the FE much more pleasant to use. I was using that VM 21mm 4.0 on Sony, it is not a good idea. Phillip, I could use your advice. I am shooting on an A7iii and already have the CV 15, which I love. I am deciding whether to buy the new CV 21 (and stick with the 2 CVs as my ultra wides) or sell the CV 15 and buy the Sony 16-35 f4. 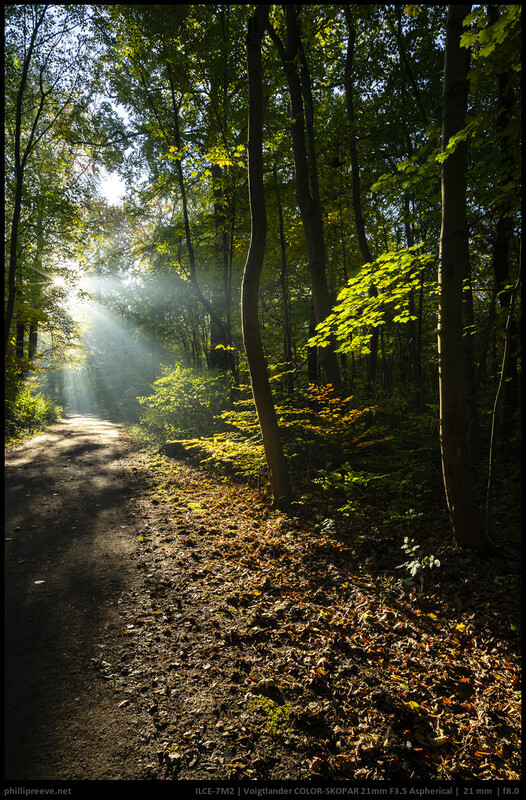 I am a pretty experienced amateur who will primarily use the wide angle lenses for travel and hiking. I have the Sony 24-105 as my basic workhorse lense. Do you recommend sticking with the CV 15 and 21 or going with the Sony 16-35? My instinct is to go with the two CVs. I’d appreciate yout thoughts. I have owned the FE 4/16-35 for a long time and won‘t sell it now that i own the 3.5/21 even tough I think about getting a 4.5/15 in the future. It is just super versatile and a pretty good performer. I prefer it when I am hinking with my GF because zoom and AF make it much faster to use than a set of three primes. When I am on my own with enough time I will always prefer to work with manual primes. Since you have a workhorse zoom in the 24-105 I think the 4/16-35 wouln‘t give you that much. 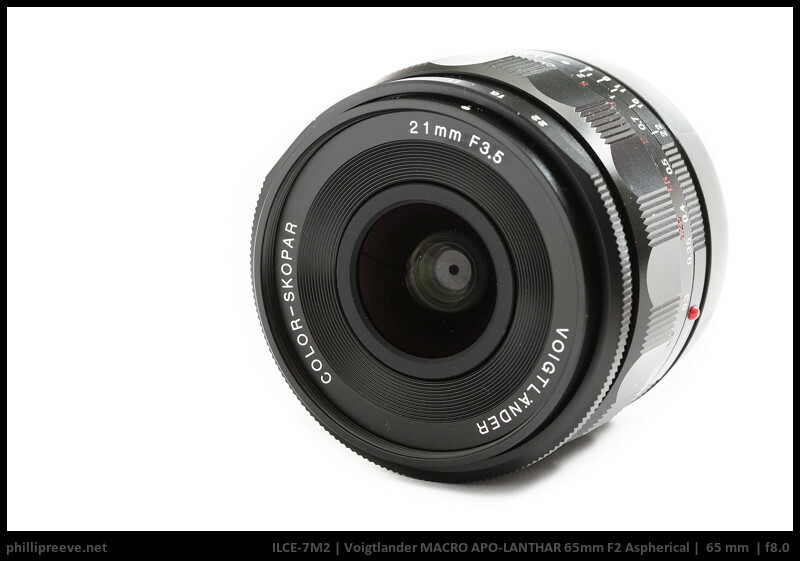 Hi, just wondering if you have tested Voigtlander 21mm f/1.8 Ultron? It is M-mount and faster than this 21mm f/3.5 Skopar but not sure if Skopar is a better choice over Ultron or not (keeping price factor asides)? It has some field curvature issues on the a7 series and is much bigger. I wouldn’t be surprised if they were close by f/8 but that is nothing but speculation. I am grateful to you, as a passionate photographer, I like to read your pages and I need to advise, I’m aware of the technical benefits of Loxia 21 and similar sites at CV21 plus its benefits in weight and size. With all the plus and minus if the price difference between the new lens of CV21 and Loxia 21 is 300 €, which one would you choose. I would like to know your opinion if the price did not play a role in the selection. Thank you and I wish everything good as well as a hill of great objectives in the next year and articles about them. 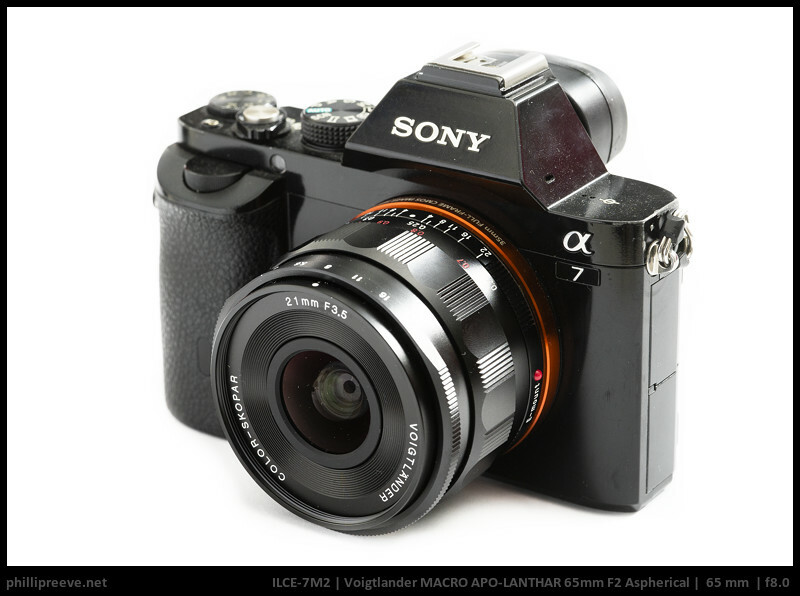 Well the Loxia performs a little better and the Voigtlander is significantly smaller. Personally I would probably choose the Voigtlander. Enjoying this little guy but wondering, is there a lens caps for the hood available as the 35mm Ultron has for its hood? I have never used it so I can only give a very general assesment. I wouldn’t expect a very significant advantage for landscape images on 24 Mp. 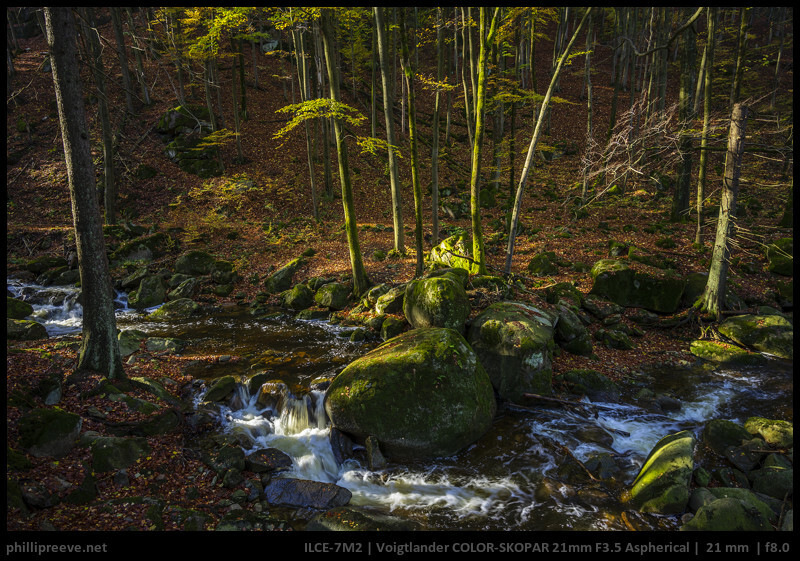 On 42mp I would expect a more significant advantage for the Voigtlander. More importabt reasons to change formme would be flare resistance, contrast and size. Could you please check how the CV 21/3.5 focus breathe? One thing annoys me with my Loxia 21/2.8, that it changes to app. 22mm below 2mtr making difficult to focus stack with it. would you choose 15mm wide heliar over this lens? Im tempted to buy 21 (much less distortion). But is it opticaly inferior to 15mm wide heliar? 15mm vs 21mm are two very different lenses. The 15mm has a lot of variance and I think a good copy would be in the same class as the 21. Can you do a review or comparison with zuiko 21 3.5 please ? It is small light and also sharp. So I’m trying to decide which to get as a travel lens. None of us has a 3.5/21 Zuiko to compare. I would be astonished if the CV wasn’t quite a bit better though, just because of era of design. I had the 3.5/21 Zuiko back in film days, and I recall being impressed compared to some other uktrawides of the era, but it had bad CA and was just sharp enough to look OK on film, but nowhere near as sharp as the normal lenses of the day. That also makes me guess that it’ll not play in the same league as the new CV. Thank you all for your work and knowledge on these lens!